Mary Charlottee Alexander : Surf Riding in Hawai'i, 1912. 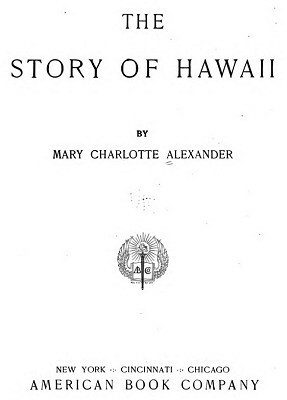 This book features Hawai'ian traditional legends, with some references to holua sliding and surf riding. "A chief, Kahawali, the champion sled-rider on Kauai, hearing of a beautiful young woman at Puna, who slid marvelous distances, brought his holua, or sled, from Kauai to race with her. On the day set for the racing, people from far and near gathered on the hill where the pili grass had been strewn over the smooth track for sliding. in maile and lehua, wearing noisy anklets of dogs' teeth that rattled with every step. Before the young woman arrived, Kahawali and a friend brought out their long shining sleds of dark kauila wood to practice. They had made them of two narrow, pointed runners, eighteen feet long, fastened together two inches apart in front and wider behind. "As Kahawali placed his sled a few yards back of the starting place, a wrinkled old hag, red-eyed and crooked-backed, limped up to him. '"I wish to slide too,' she whined.
"' What does an old woman like you want of a sled?' Kahawali answered in surprise. "Out of pity, Kahawali's friend pushed his sled forward. The old woman and Kahawali grasped the sleds at about the middle with their right hands, and running to the starting point, threw themselves with all their might upon them, diving head-foremost down the steep hill, and gliding with lightning speed over the plain below. Kahawali slid farthest and won the race. For over two years Kamehameha lived in Kohala, but not in idleness. 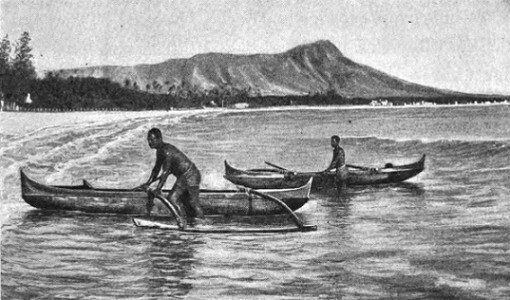 One of the first chiefs to show the dignity of labor, he hollowed canoes with tools of bone and shell, fished with mother-of-pearl hooks, and with an oo, a sharpened stick, planted taro and cultivated his lands. at Halau that Kamehameha planted before his beard was grown; a fish pond at Kiholo, a canoe landing there; and a tunnel in a ridge at Niulii for a water course, incomplete, because he had no powder to blast through the rock. Kamehameha excelled in his favorite sport of surf riding. One day, when he and his brother were scudding in front of the white breakers, he was surprised to see his military teacher, Kekuhaupio, the veteran warrior, approaching in a canoe. Dripping, he hurried to give him welcome at his house. After the old teacher had saluted Kamehameha with strange homage, he gently reproved him for pursuing pleasure at such an unsettled time. "You should be bearing a hand in the affairs of Hawaii," Kekuhaupio chided. It was near the close of November, the Hawaiian New Year was at hand. The people dressed their houses with new mats, and decorated them with green boughs. Forty days before, heralds had proclaimed the approach of the makahiki, or New Year's festival. This celebration was held in honor of the kind god Lono. The idol of Lono would be dressed, and carried around the island while the taxes were being collected. hands would become tabu in touching the idol. It was a time of games, of rest from all work, of peace and good will. No hoarse conch shells could scream for war. The night before the festival, bonfires glowed on the beach. As the ocean would be tabu four days, young and old lined the sand, pushing seaward with their long light surf boards of wiliwili wood, swimming toward the toppling white breakers. A fringe of mountain-high waves. Wave-feathers fan the surf rider." People from other districts had come to attend the festival. Keeaumoku, who had charge of the Kona district, had brought his family. By the dim moonlight above the curling waters, Kamehameha saw for the first time Keeaumoku's beautiful daughter, Kaahumanu, the Feather-Mantle. She was only seventeen, but she vied with him in going far out into the mountainous surf, and rushing in between jagged rocks, where none others ventured. Poised on her board, Kaahumanu rode the waves with easy mastery. Kamehameha had never before met any chiefess like her. Later, as they warmed themselves by the bonfires, he listened to the music of her voice, sweet as the singing of the iwiiwi birds on the hillside. To win her approval, he vowed that he would be victor in all the games that were to come. The next morning the festival began. During four days land and sea were tabu to Lono. Only feasting and games in his honor could take place. As evening came on, the priests set up out of doors a short idol called the god of sports. A multitude of ten thousand people gathered to see the games. First came the foot races in which the girls could run. 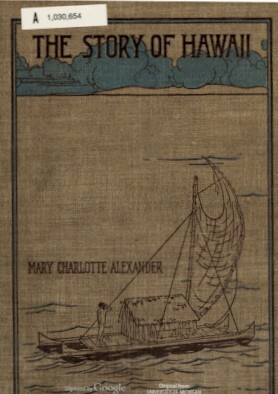 Geoff Cater (2013) : Mary Charlottee Alexander : Story of Hawaii, 1912.